Lt. 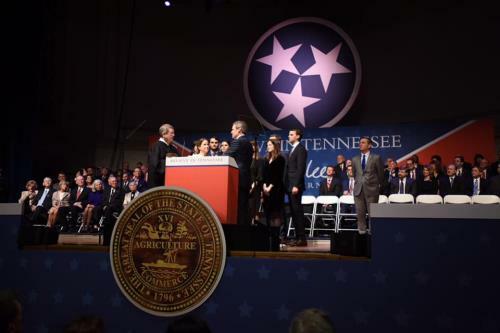 Governor Randy McNally (R-Oak Ridge)said Saturday, following the inauguration of Governor Bill Lee by joint convention of the Tennessee General Assembly, that the new governor will continue the state's recent success. "Despite the weather in Nashville, today was a beautiful day in Tennessee. The inauguration of Bill Lee gave this state something not seen before in modern political history, the succession of one Republican governor to another. "The first eight years of unified Republican government have been remarkably successful. The next eight will be even more so. In Governor Bill Lee, we have a leader who will solidify our established foundation of success and continue to build upward. "As he criss-crossed this state visiting all 95 counties twice, Bill Lee inspired all our citizens to continue to believe in Tennessee. His vision for our state will extend our prosperity across the grand divisions and throughout our population. "Bill Lee is the right governor at the right time. Together, we will take what is already very good and make it great. I look forward to working with him to keep Tennessee on the right track." Governor Lee said, "Thank you, Tennessee, for entrusting me with this incredible honor. I am humbled by your support, and I look forward to what the next four years have in store." After the event at the War Memorial Auditorium before the General Assembly and other guests, Governor Lee said, "It was a tremendous way to start the morning at our faith service. Thank you to Michael W. Smith, Darrell Waltrip, Scott Hamilton, Mike Fisher and everyone who joined us for helping us kick off the special day.